Carl J. Wall, age 102, of Aurora, formerly of Hampton, passed away on Monday, June 26, 2017, at the Memorial Community Care. Funeral Services will be held at 10:30 A.M., Thursday, June 29th at St. Peter Lutheran Church in Hampton. Rev. Paul Kern will officiate. Interment will be at the Hampton Cemetery. Visitation will be from 5 - 7 P.M. Wednesday at St. Peter Lutheran Church in Hampton. Memorials may be made to the family to designate at a later date. Higby-McQuiston Mortuary in Aurora is in charge of arrangements. Condolences may be e-mailed to the family through the mortuary website at www.higbymortuary.com. 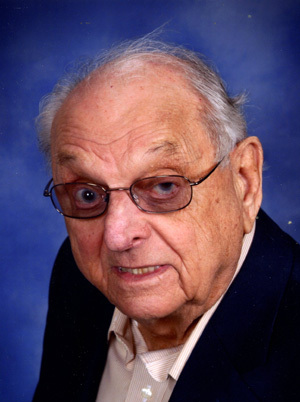 Carl John Wall, the son of Christian and Katherine (Bamesberger) Wall, was born in Hampton, Nebraska on May 20, 1915 and passed away at Aurora, Nebraska on June 26, 2017 at the age of 102. Carl was one of 12 children. Carl graduated from Hampton High School in 1933. Carl enlisted in the U.S. Air Force in 1941 and retired from the Air Force in 1951. He was promoted to Master Sergeant in 1943. Carl served in both WW II and Korea. Carl completed four aircraft and engine schools in the Air Force, plus and Air Force Inspectors School. Carl was extremely proud of the time he spent in the Air Force. Carl was united in marriage to Edna Vera Miller on October 18, 1945 at Salt Lake City, Utah. Following their marriage they lived in to California where they made their home in Granada Hills. After retiring from the Air Force, Carl worked for the City of Los Angeles caring for their golf courses until his retirement. Edna passed away on July 5, 2004. Carl moved back to Nebraska to be closer to family. He made his home at East Park Villa for six years, before moving to Memorial Community Care. Carl was a member of the 8th Air Force Historical Society. He was a life member of 351st Bomb GP Assoc., Veteran Foreign Wars Post 2266, American Legion Post 53, Air Force Sergeants Assoc. and Lester S. Harter Post #42 in Aurora. Carl completed one year at Cal-Aero Tech and received his diploma as a Master Aviation Mechanic and FAA License, plus Private Pilot’s License. In California, he was a member of Prince of Peace Lutheran Church and upon returning to Nebraska was a member of St. Peter Lutheran Church in Hampton. He was preceded in death by her parents; wife, five brothers and six sisters. Those who remain to cherish his memory are his nieces and nephews and many close friends.